Create fuller, thicker-looking locks with the Redken Defy Thinning Hair Bundle with Thickening Treatment, a trio of haircare treats to strengthen strands, create a healthy scalp environment and restore shine. Boost your locks with an effective cleansing formula designed to visibly thicken hair while offering a deep cleanse. Enriched with Zinc PCA, the gentle shampoo is able to strengthen the fibre and discourage breakages, as well as reducing DHT. The cleanser eliminates excess sebum and follicle-clogging impurities from the hair and scalp, leaving hair ultra-clean, shiny and visibly fuller. Nourish your scalp with a hydrating formula that works to thicken and strengthen locks while encouraging a healthy scalp. Fortified with strengthening Ceramide, the award-winning conditioner is able to prevent breakage, as well as delivering lightweight body and enviable shine. The formula invigorates locks with a Ginger Mint fragrance and leaves hair manageable, visibly thicker and nourished. Achieve full-bodied locks with a thickening spray enriched with Filloxane, that visibly plumps each strand to deliver an increase in body and volume; giving the illusion of more hair. The treatment also strengthens the fibre due to Ceramide, which helps to prevent breakages. Expect enviably thick and healthy hair. Shampoo: Apply to wet hair, massage into a lather. Rinse. 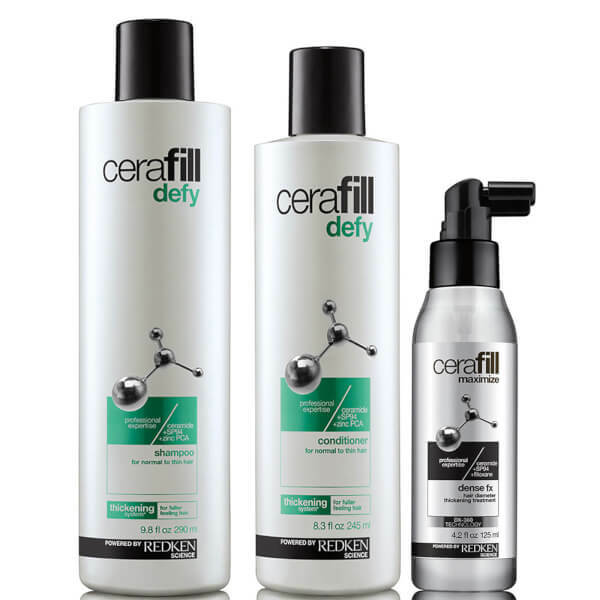 Conditioner: After shampooing with Cerafill Defy Shampoo, apply and distribute through hair. Rinse. 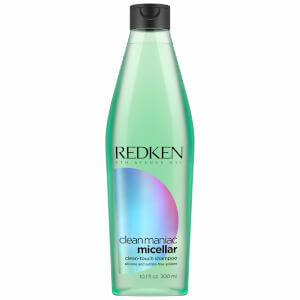 Treatment: Apply daily to damp hair section by section beginning at scalp. Massage gently at the root and work through to the ends, re-apply for optimal results. Do not rinse. Layer any additional styling products. Style as usual. Shampoo: Aqua/Water, Sodium Laureth Sulfate, Citric Acid, Cocamidopropyl Betaine, Sodium Chloride, Sodium Hydroxide, Parfum/Fragrance, Hexylene Glycol, Sodium Benzoate, Menthol, Zinc Pca, Salicylic Acid, Polyquarternium-10, Benzyl Alcohol, Limonene, Linalool, Geraniol, 2-Oleamido-1, 3-Octadecanediol, Safflower Glucoside (D164121/5) Us Pat./Brevet Americain: 5, 618, 523; 5, 661, 118; 5, 916, 549; 7, 763, 587. Treatment: Aqua/Water, Alcohol Denat., Pvp, Propylene Glycol, Phenoxyethanol, Polyacrylate-3, Oleth-20, Triethanolamine, Methylparaben, Parfum/Fragrance, Oleth-10, Menthol, Benzyl Alcohol, Limonene, Linalool, 2-Oleamido-1, 3-Octadecanediol, Aminopropyl Triethoxysilane, Safflower Glucoside, Geraniol Us Pat./ Brevet Americain: 5, 618, 523; 7, 763 ,587 (D165165/1).